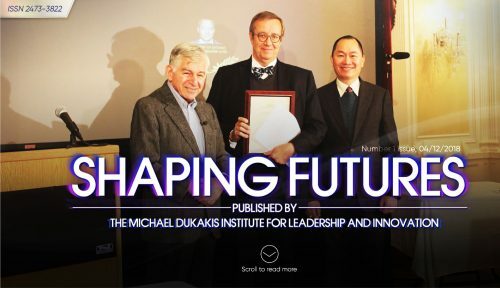 The Michael Dukakis Institute for Leadership and Innovation (MDI) has launched Shaping Futures magazine. The new magazine will cover Artificial Intelligence (AI) and Cybersecurity innovations, initiatives, and solutions, as we with a focus on creating a better world for all mankind through the ethical implementation and expansion of technology. Print and digital copies of the magazine will be published twice annually, with articles compiled from special events and editorial content created by members and delegates participating in the MDI’s events, symposia, as well as whitepapers and think-pieces. For this first issue of Shaping Futures, our editorial team has introduced the AIWS initiatives and some of the many achievements of Boston Global Forum (BGF) and MDI as we continue to work with top thinkers and leaders in AI and Cybersecurity to create the best possible future in a world that increasingly relies on technology. How will the world order be reshaped by artificial intelligence?